Last year, I had the fortunate opportunity to be a guest at the GMA News TV show, Pop Talk. Since that would be my third time to do it, I was kind of wary of accepting the gig. Don't get me wrong, I enjoyed both guest appearances, but I was thinking of asking to recommend another blogger friend of mine who hadn't been on the show yet, just in the spirit of friendship and giving others a chance. However, once I found out we would be reviewing Hotel set meals and buffets, I thought to myself, "Screw friendship, I'm in!". It was actually a fun episode, however we had the misfortune of ending up at The Pantry at Dusit Thani Manila as our last stop. I say "Misfortune", simply by the time we got there, we were all so full from reviewing two other restaurants, so when we arrived at The Pantry, we were all too stuffed to actually enjoy the meal. Admittedly, I wasn't able to make the most of my short but sweet visit there, but I swore I would be back again, this time, with an empty stomach so I can get my fill of The Pantry's dishes. Lo and behold, just a few months later, I found myself roaming around the Pantry, and boy did I make up for the last visit! I believe The Pantry replaced "Basix" as Hotel Dusit Thani's flagship restaurant. Though I barely remember what Basix looked like, the warmer, more welcoming tones of The Pantry got me feeling right at home. The Pantry boasts of "Farm To Fork" dishes, by incorporating only organic and locally sourced ingredients from their gastronomic creations. And here are a few of the many highlights from one of the best buffets in the metro! I immediately made a beeline for the Lechon Station, which is roasted in full view of the guests, by means of a small glass "Roasting Room" near the carved meats section. The Pantry's "Signature Lechon" is clearly the crown jewel of the spread. The HUGE roasted pig had an unbelievable crackle to its skin, giving way to the moist, beautifully cooked meat. Granted, the meat doesn't have the herb infused notes of the Cebu style that I'm used to, but the natural flavor of the pork is the star. If you're looking for a more robust flavor, then you can add liver sauce, or choose from the plethora of BBQ Sauces on the Grilled and Carving station! Another item you must not miss is the Baby Back Ribs.The perfectly smoked, fall of the bone slab of Pork Ribs is coated in a lightly sweet BBQ Sauce, It had an ample amount of fat to keep my taste buds tantalized I must have gone back for this three times. The Grill Station includes a wide array of meats and seafood that you may choose from, as well as other classic dips that will further enhance your dining experience. My favorite item was definitely the sausages! I was told that it was "Hungarian", but it tasted more like the Breakfast Country Sausages that I love! Even The Hungry Kat couldn't get enough! You can make a pit stop at their Italian station for some pizzas or made to order Pasta dishes! The Mediterranean section features popular dishes, such as Chicken Kathi Roll, and Shawarma! And Great news for our Muslim Brothers and sisters.. The Pantry's buffet is Halal Certified! My lovely friend Aleah of Dusit, led me on a tour of The Pantry's Indian section, but not without picking up a few scoops for herself! I can categorically state that Dusit makes one of the best Samosas you'll find in town! Also, The Pantry is equipped with their own Tandoori Oven, so they have one of the most authentic tasting Chicken Tandoori dishes you'll ever have without having to book a flight to New Delhi. The Pinoy station allows their guests a glimpse of some home grown Filipino cuisine, with classics such as Pancit Guisado and Pork Shoulder Bistek Tagalog among the standouts. The modest Chinese spread included the Crab in Black Pepper Sauce and for those looking for veggies, you can opt for the Stir fried Brocoli with Garlic. Also available is a Dimsum station, that inlcudes Siomai, and Rina's favorite Hakaw. If you need a fill on seafood, then you'll be elated to know that The Pantry has an extensive seafood selection where you may have fresh seafood cooked to your liking! A popular dish is always the shrimps sauteed in butter garlic, while the Oysters are baked with rich cheese. The Pantry also has a nice selection of cakes and pastries for you to choose from, ranging from classsic Blueberry Cheesecake, to Native Filipino Delicacies, such as Bico and Puto. My favorite among the pastries was the Donut Station! Even just the simple, Powdered Donuts were to die for! You're going to have to forgive me because I was using a different camera, and some of the other pictures I took didn't come out right, but FYI there is a Sandwich Station that served delicious Roast Beef Sandwiches, as well as a Salad and Maki Station. Click Here to See the Facebook Live video for the full Tour! Thank you to our beautiful hosts for the day, Dorothy and Aleah for an amazing meal. The Pantry is a shining example of how organic and locally sourced produce, can be made just as flavorful and delicious as other products when done right. The KTG's Visit To the Pantry was truly a memorable one. We're looking forward to many more happy returns to Hotel Dusit Thani! DUSIT THANI & MINI COOPER! Dusit Thani Manila celebrates Father’s Day on Sunday June 19, 2016 and offers the Dusit guests with two wonderful options to make the men of the hour feel truly special. For those who are looking for an overnight stay for Dad that weekend, Dusit Thani offers a special room package starting at PhP6,000.00 ++. Dad’s staycation package includes complimentary buffet breakfast for two at The Pantry, a choice of either a 30-minute signature head and shoulder OR foot massage from Devarana Spa, guaranteed late check-out until 2pm, complimentary high speed wifi, complimentary access to the outdoor pool and DFit, a 60-minute Asian Blend Massage from Devarana Spa (for suite bookings) plus the chance to test drive the latest Mini Coopers on June 19, 2016. 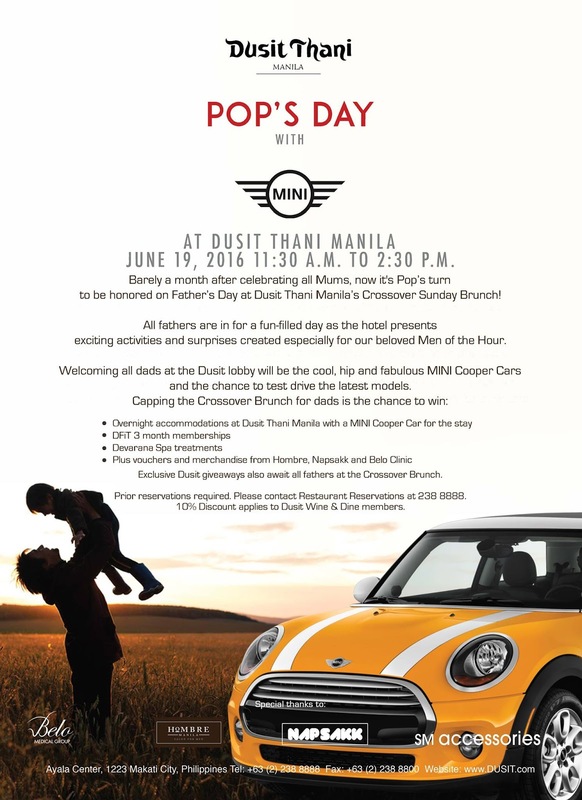 For those looking for a place where to treat dad on his big day, our special event POP’S DAY WITH MINI AT DUSIT will be the perfect choice. On Sunday June 19, 2016, helping the Dusit welcome all dads are the latest and coolest Mini Coopers on display at the lobby. The Sunday Crossover Brunch at The Pantry on Father’s Day will be a great place to take Dad for a gastronomic buffet selection, the most exciting raffle prizes from Dusit and sponsors Belo Medical Group, SM Accessories, Uratex, Hombre and Napsakk. The raffle prizes include overnight stays at Dusit Thani Manila accompanied by a Mini Cooper during the stay, Devarana Spa Treatment certifiocates and DFit 3 months membership and a chance to test-drive the latest Mini Coopers on that day. Each Pop dining at The Pantry will get to bring home a loot bag with lots of special merchandise from our co sponsors. So let this Father’s Day be the perfect opportunity for you to show your gratitude and appreciation to your hero. After all, he deserves all the love, attention and affection he can get on this most special day.